NOTE: Back in September, in response to Alf Clausen’s firing, I posted what would be a new chapter for an expanded version of “Zombie Simpsons: How the Best Show Ever Became the Broadcasting Undead”. The book is still being shopped to publishers, and early responses have been mixed, in that some of them ignore it, and others reject it. But it’s Simpsons Day, and I’m a long way from giving up on it, so here is another new chapter. It’s very loosely based off a post on this blog from 2010, so for once I’m repeating a quote intentionally instead of accidentally. Feel free to smile and nod and link and share this page [stomps on your foot]. The more traffic and attention it gets, the better chance it has of becoming a real, dead-tree book at some point in the future. Also, on your way out, if you want to post it to /r/TheSimpsons, it would help me a lot. Released in 1993, Jurassic Park is a classic movie, one of the most popular in the history of cinema. It’s enduring popularity has green-lit three sequels, all of which are forgettable summer pap and none of which grace “Best Ever” film lists. (A fourth is set for release in 2018.) Published in 1965, Dune is a science fiction masterpiece that was followed by five direct sequels, thirteen follow up spin-off novels, a television miniseries, and a 1984 feature film. None of them have ever lived up to the source material, but the original remains so popular that spinoff novels continue to be published and they’re making another movie adaptation right now. Sequels, spin-offs, reboots, and remakes are unfortunate side effects of the economics of modern media. Familiar franchises (or “IP”, a/k/a “intellectual property”) are safe economic bets for studios that care far more about the quarterly earnings of their conglomerate owners than they do about artistic merit or simple quality. This is the reason that American multiplexes average a new actor playing Spider-Man every five years, a new Batman every six years, and a new James Bond every nine years. The acceleration of this trend in recent years is a triumph of what the marketing ghouls call “mindshare.” Basically, the more people that are aware of something (a character, a celebrity, a franchise, etcetera), the more “mindshare” it has. For example, Star Wars has approximately 100% mindshare, since there’s almost no one who hasn’t heard of it. Once a property or format has proven itself popular, the mindshare that popularity creates means that something similar is more likely to find an audience than something new. This is why NBC has broadcast five versions of Law & Order, why CBS has had four different CSI variants, and why ABC has had more seasons of Dancing With and Bachelor shows than is mentally healthy. Put simply, a new show with an existing audience is more likely to attract large enough ratings to be profitable than a new show that has to start from zero. Zombie Simpsons is simply an extreme case of this widespread miasma. 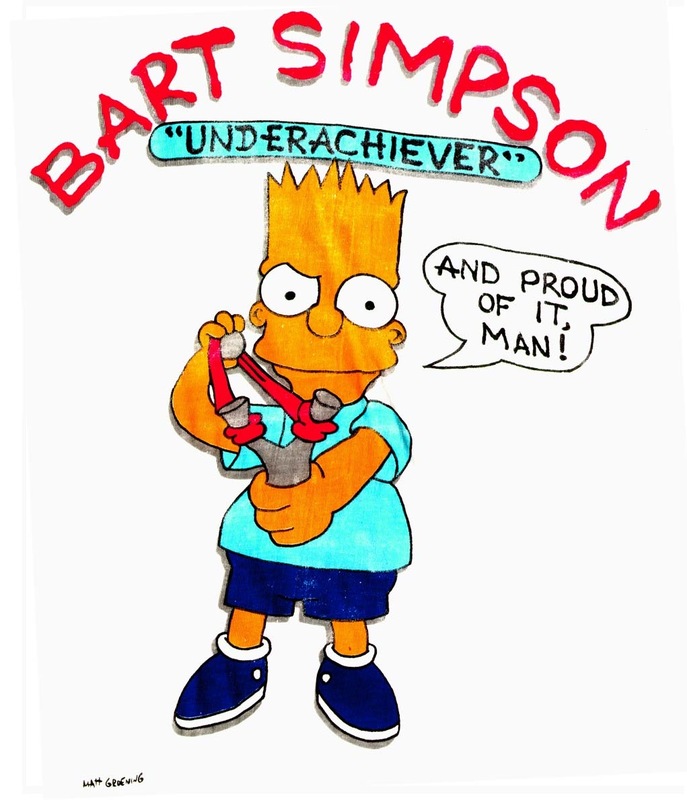 The enormous and unprecedented popularity of The Simpsons means that there are hundreds of millions (if not billions) of people all over the world whose brains have a few neurons dedicated to Homer, Bart, and the rest of the family. So what critics or fans think of the last twenty years of the show is a lot less important than the rump audience that will tune in out of habit or familiarity. This unfortunate confluence of behavioral psychology and modern economics has been very good to FOX’s (and News Corp’s) bottom line, but it has done terrible damage to the once impeccable reputation of The Simpsons itself. For anyone born in the mid 1980s or after, The Simpsons has been a background presence their entire lives. But as the new episodes got worse at the end of the 1990s, and then as the pool of syndicated reruns gradually became polluted with Zombie Simpsons, watching the show became more and more difficult. In 1995, you could catch a great new episode on Sundays, then watch two or more classic episodes every weekday on syndicated reruns. By 2005, the new episodes had been bad for half a decade, and the syndication runs were 50-50 with Zombie Simpsons. The episode catalog has only degraded since then. There are now more than twice as many episodes of Zombie Simpsons as there are of The Simpsons. As a result, a new or casual fan has to go out of their way to see the good ones. Because all of them are billed and sold as “The Simpsons,” there isn’t the kind of easy distinction that there is between Jurassic Park and its many sequels, or Dune and its lesser iterations. While there are no general social surveys about the state of Simpsons fandom, there is ample anecdotal evidence that nearly two decades of Zombie Simpsons has profoundly damaged The Simpsons in terms of cultural reputation, pop culture standing, and even simple popularity. On the enormous web of message boards which are such a big part of modern fandom, it’s easy to find huge threads about the show being overrated, or having been bad for so long that maybe it wasn’t that good in the first place. Facebook teems with teens and twenty-somethings who know the show only as a cultural totem that gross old people revere for some reason. A sadly large portion of Reddit’s trigger-happy cadre of fanatics are all too happy to dump on Zombie Simpsons without making the distinction between old and new, good and bad. Statements like the above have to be made with caution because Simpsons fandom is so vast, ancient, and iterative that it would take half a department of sociologists just to catalog it, much less understand it. But the clearest example may have been in August of 2014, when the FXX channel broadcast every episode of the show in order, starting with Season 1. That was the first time since the syndication pools became tainted that so many of the classic episodes were made so easily available to a wide audience, and the reaction was overwhelming. Wow, I forgot how great the Simpsons was in its early years. Loving the #EverySimpsonsEver marathon. Forgot how good the old episodes are. Watching #TheSimpsons and I forgot how dramatic season one was! Watching the #EverySimpsonsEver marathon on FXX. I almost forgot how good the old episodes are. Way better than the new ones! All of the above examples came from only one hashtag, only on Twitter, and only from the first couple hours of the marathon broadcast. It went on like that for days, across all kinds of platforms and (presumably) in personal conversations and interactions that never reached the wider internet. As the good seasons were once again shown without the handicap of Zombie Simpsons, people remembered why The Simpsons really is the Best. Show. Ever. Amnesia like the above isn’t at all surprising when you consider how much effort it takes to experience the show in its true form. Local syndicated broadcasters are under no obligation to run episodes in order, FXX always sprinkles Zombie Simpsons in with The Simpsons, and new episodes have been bad since Bill Clinton was our standard for what a lousy President looked like. (That The Simpsons predicted the orders-of-magnitude worse President Trump doesn’t help matters.) Watching them the way Jebus intended means either shelling out for the DVDs, buying them from a streaming service, or logging into and then navigating FXX’s kludge filled app. In the 1990s, new fans could simply sit down and watch The Simpsons. Today’s new fans have to work at it. More motivated viewers will deliberately do so, but, inevitably, lots of casual fans will not. As a result, they often don’t understand what’s so special about The Simpsons. All they know is that it’s been on the air since before their parents met. Television has never seen anything like what The Simpsons was at its beginning. It wasn’t just smart and funny, it was smart and funny week after week, year after year, never skipping a beat. Forget season finales or cliffhangers, ordinary new episodes were social events in bars, dorms, and homes all over the country. The day after a new episode, conversations in schools and offices brimmed with quotes, jokes, and phrases from the night before. But the magic of that incredible consistency gets lost when the old episodes are buried among the dung pile left by nearly twenty years of Zombie Simpsons. This is why Zombie Simpsons needs to be criticized. Not because it’s a boring, mediocre television program (there are lots of those), but because each new episode eats away at the foundations of one of the most important and influential shows ever made. 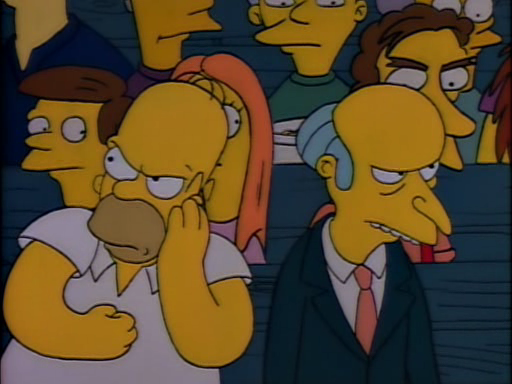 Every year a new batch of Zombie Simpsons spews into the rerun pools and episode guides, stealing scarce and easily diverted attention away from the good ones. And so each new batch of potential fans has to work a little bit harder to see the good stuff. Bit by bit, Zombie Simpsons is poisoning The Simpsons for future generations. The Simpsons always took a pretty dim view not just of human nature, but of human existence generally. Misdeeds are rarely punished, triumphs are rarely recognized, and justice is all but non-existent. After all, if there’s one thing Homer’s learned, it’s that life is one crushing defeat after another until you just wish Flanders was dead. So, in honor of Simpsons Day, here are some of the show’s most existentially bleak lines. This list is by no means meant to be exhaustive, so feel free to suggest your own in the comments. We only ever see Jack Marley in “Marge Gets a Job”, and he breaks down sobbing at this short, horrifically bleak summary of his own life. Worst/funniest of all: later we see him not get his job back, which means that the reason we haven’t seen him again is probably because he died shortly thereafter. The children – presumably very sick ones – who’ve been waiting for a new hospital so they can get better, will now continue to suffer and die because Homer Simpson wanted a crappy bookshelf. Truly, fate is cruel. The first time I saw Rick & Morty‘s ultra-depressing butter robot, I thought of Frink’s doomed bear. It’s a sentient being staring into an unanswerable existential crises because it was somebody’s side project. At least the robots in Westworld are magnificent masterpieces, the bear and the butter robot are hopeless. Even youth cannot protect you from obsolescence and death. There’s a reason I see this line quoted all the time as one of the show’s best: it’s depressing when you’re a kid, and it just gets worse with each passing year. Happiness is only ever attained by a few people, and certainly not by you. Congratulations on your nuptials. Your beliefs and activism are probably futile, and even if you succeed it won’t have the effect you wanted. Vote Trump. I’ve said it before and I’ll say it again: nobody got it worse on this show than old people. This poor, lonely old lady has her heart warmed because the family that imprisoned her in the Springfield Retirement Castle (Motto: Thanks for not discussing the outside world) sent a fax. Forget just on The Simpsons, that’s one of the saddest things on television ever. A funeral with no guests, save two men who were waiting to profit from his death, now that’s bleak. A life spent entirely in Springfield, his only skill made obsolete, and then an unnoticed demise, Asa Phleps had it every bit as bad as Frank Grimes. At least Grimey’s funeral had mourners. We’ve got some great stuff on its way out, just stay tuned for the Nintendo game, and the Simpsons pinball machine, the official Bart Simpson vehicle of destruction, that’s a skateboard, and lots more. I think it’s a very insidious way of keeping people paying attention to a TV show is to make little short cartoons about the length of a commercial so people had to pay attention. If you blinked you’d miss them when they were on the Tracey Ullman show. Well, if you watch them on Lifetime, cable, you’ll see that the Simpsons have transformed quite a bit since the early days. Ha! Now 1990 is the early days, far more so than 1987 was at the time. The cameraman isn’t doing anyone any favors here, but note the big cheer that goes up from the crowd at the 15 second mark when they recognize the theme. It’s much bigger than the cheer that the band got before they started playing Elfman’s catchy masterpiece. Finally, this is a video from 1990 produced by British Sky Broadcasting for “dealers”, which I presume means the middlemen who have to decide whether or not to carry the channel. Basically, it’s an in-house promo for how great their programming is and why it’s worth carrying. At the 7:30 mark they talk about Sky One and how it reaches tons of younger viewers, and they specifically cite The Simpsons as a big reason why. I’ll hopefully have more a little later. In the meantime, happy Simpsons Day, everybody! There are a lot of familiar names, plus late 80s fashions and gizmos, on display. And, wow, David Silverman looks like Unfrozen Caveman Director. Celebrities voicing themselves works so much better when it’s a dedicated promo and they, you know, cram it with jokes. On Simpsons Day last year I posted an old video of Groening on Letterman right before “Simpsons Roasting on an Open Fire” premiered. He wasn’t exactly camera comfortable then. Here’s an interview with him from The Tonight Show in 1991 (this must be Leno guest hosting for Carson), and he’s got his shtick down much better. 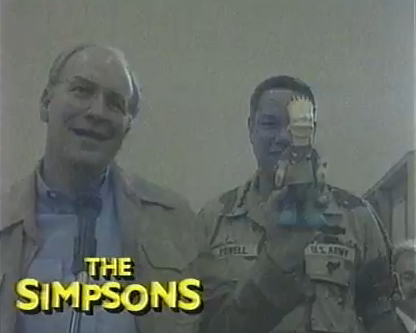 This has to be shortly after the premier of the third season when the show couldn’t get a bigger, and even then Groening only rates as the third guest. What’s funny is that Leno asks if that really was Michael Jackson’s voice, and Groening has to demur. It’s kinda hard to remember now, but The Simpsons really was a subversive show that a lot of people were genuinely nervous about. How quaint.